Since Father's Day is just around the corner, this week I'll be sharing about the favorite Dad in this house! I grew up in a home without a father, so watching a real dad in action is a wonder to me. I knew we were much alike when we both admitted reading encyclopedias for entertainment. He loved Childcraft's Things To Make And Do, and he's passing the fun of making do to our son. Yesterday's project was devising a homemade parachute for a yard sale GI Joe. They experimented with several shapes cut out of trash bags and tied with kite string. Finally they built a launcher out of a water bottle cut in half, secured to a butterfly net with rubber bands. It was a thrilling morning! I am glad you posted a little picture of your husband. He looks like a very nice man, and looks slim and trim, too! ( I know that you had posted that he has lost a lot of weight!) You are right in saying that a wonderful husband and father is one of the greatest treasures in the world. I am thankful for you that God has given you such a man. Wishing your husband and you a very happy Father's Day weekend as you enjoy the two little blesings that God has given to you! We had that book when I was growing up. I LOVED it!!! I've looked all over for a copy to give him for Father's Day--no luck locally, though. Say what you will about the ease of encyclopedias online or on CD-Rom, there's just something about picking a volume out of a set and flipping through it when you are bored. Ah, ha! NOW I see where the little guy's creative imagination comes from! Way to go, Frugal Dad! I loved Childcraft as a kid, especially that volumn. You guys are kindred spirits! Meridith, You might want to try Katy Budget Books. They get in used sets of childcraft and might have a copy of Make and Do for probably around $2 to $3 plus bookrate shipping and handling. They have a very good selection of used books. Lots of childrens books at very good prices.Katy is a suburb of Houston, Texas. They also will make used request cards for books you are searcing for and notify you if they come in. No charge for this service. Phone # for store 281-578-7770. Hope they can help you in your quest for childhood favorites. A Daddy that plays is such a great treasure! My Dad was an older man, raised poor [as children, they picked up coal that had fallen off railroad cars to heat their home]by a widowed mother, went through the depression shortly after marrying... he worked and he worked hard his whole life. We didn't play together but we did all kinds of work [yard, construction, repairs and home dec., washing the car! ]and that's a good memory for me. I knew my Dad wanted the best for me and he was always on my side. 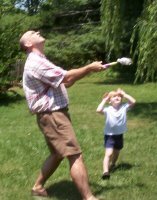 My husband has never played with our children either but I am so pleased that our sil is a hands on father. He plays ball with them, they wrestle all over the floor and dd told me this A M when the boys came into their bedroom to say good morning, he turned each one upside down with much tickling and laughter. That was a joy for me to hear. Your husband looks like a wonderful young man. I know you will engineer a happy day for him Sunday.